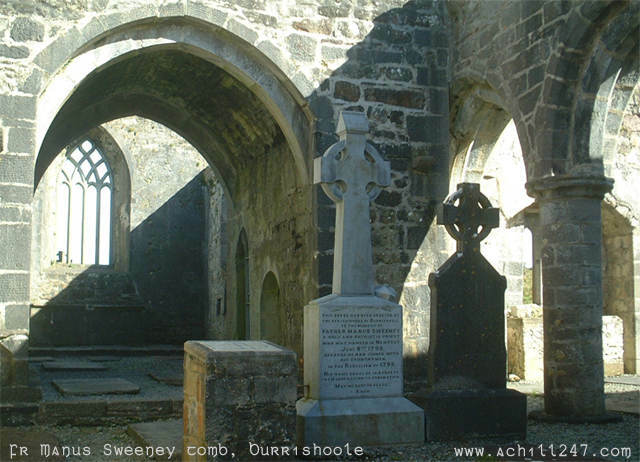 Fr Manus Sweeney was a Catholic priest with strong Achill connections (according to accounts either he or his father was born in Dookinella). Educated in France, he was present in Newport during the attempted invasion by French forces, led by General Humbert, in 1798. He was spotted speaking French to the invading army and was later hanged by the British for this offence. The execution took place in the market square in Newport and his body lies under this gravestone within Burrishoole Abbey, near Newport, Co Mayo.